These were the final words uttered by Leonardo DiCaprio in 2014 when he called for the United Nations to act to mitigate the threat of climate change. They also marked the start of the Climate-KIC Climate Negotiation Simulation taking place simultaneously in Berlin, London and Zürich. The simulations were part of an initiative to give those taking part the opportunity to experience the intensity of the upcoming Conference of the Parties in Paris (COP 21). 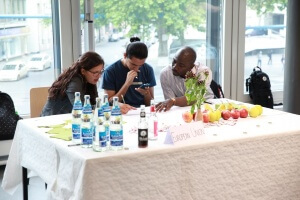 I had initially been approached to help organize the simulation in Zurich but was attending a conference in Berlin. Luckily for me there was exactly the same event going on there as well so after a long day of presentations I took my place as an observer at the back of a room in Berlin Technical University as it filled with eager participants. 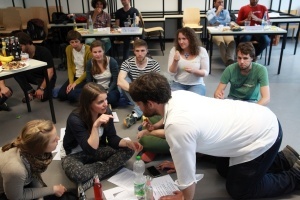 The simulation was led by Professor Florian Kapmeier an experienced facilitator for the Climate Interactive simulation developed with the Massachusetts Institute for Technology. The simulation was designed to help people understand the challenges of negotiating a comprehensive treaty to ensure that the world meets the 2°C target agreed to in Cancun COP in 2010. The simulation centers on C-ROADS, software which was developed to quickly calculate the effect of countries emissions reductions in achieving this target. The software has been used by the US Delegate to the COP and endorsed by US Secretary of State John Kerry. The technology is particularly necessary in enabling users to understand the different types of emissions targets countries put forward. For example Canada’s 2015 pledge to reduce emission by 30% based on 2005 levels by 2030 would actually represent a 6% increase if, like the European Union, 1990 was used as the baseline. The cutting edge software employed in the simulation was complemented by some more unusual methods to illustrate the disparate wealth between the countries involved in the negotiation. While those representing developed countries had their tables laden with an abundance of soft drinks, crisps, fresh fruit and biscuits those representing the developing countries were left without even chairs to sit on. This ignominy no doubt ratcheted up the tensions in the room and as soon as Professor Kapmeier had begun the simulation a group from the developing countries descended upon the table of the US with demands for swift action. Some members representing the developing countries even decided to commandeer the treats that had been bestowed upon their more fortunate colleagues. After half an hour the first negotiation round came to an end and delegates returned to their seats, or to the floor, to announce their proposed cuts in emissions. There had been some significant progress with Professor Kapmeier declaring the result to be the best he’d seen after a first round of negotiation. In spite of this when the figures were entered into C-Roads the software depressingly showed that more action would be necessary to achieve the 2°C target. With some words of warning, should they fail to reach an agreement, ringing in their ears, the participants once again delved into some heated discussions. Bottles of sugary drinks were knocked over, biscuits were trodden into the group until once again a new set of targets were read out by each delegation. 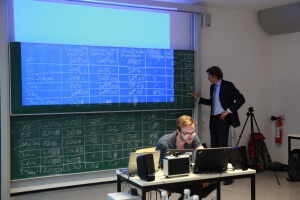 The good result of the first round was however not replicated and unfortunately the final figures showed that the Berlin simulation had not managed to find a solution to reach the 2°C target. There was some jubilation in the room though when it was revealed, via webcam, that the result was at least better than that achieved 844km away in Zurich. What the simulation made absolutely clear was that there was no room for one country to shirk from its responsibility to tackle climate change. Even if developed countries stopped emitting tomorrow this would still see the world’s temperature rise above 2°C if developing countries were to continue as normal. As soon as the simulation had started I regretted my decision to only observe and it was all I could do on several occasions not to jump in, knock some heads together and attempt to push some of the more obstructive participants towards an agreement. A natural exasperation shared by all observers and humans who would rather do something than nothing. With effort I managed to hold back and comfort myself by occasionally stealing some of crisps and the occasional biscuit which had been provided for the developed countries whenever everyone else was busy. There is however a certain pleasure in voyeurism and I got to witness the participants experience some of the basic emotions which embody high pressure negotiations. In particular, the stress caused by time pressure, accompanied by a flurry of activity to reach an agreement before the deadline, resulted in some flustered faces and outbursts of emotion. Luckily, unlike at the COP where negotiations have often gone late into the night and even been extended by several days, our negotiation finished on schedule in part due to the cleaners coming to chuck us out of the room. The simulation was a great success and those who took part were under no illusion as to how difficult it is to find an international solution to tackle climate change. Even amongst a group of passionate advocates for emissions action when constrained by a restrictive negotiation mandate progress can be difficult to achieve. What was once again obvious, as it is in every negotiation whether real or a simulation was that individuals, no matter who they are representing, can have a big impact on facilitating an agreement. A powerful personality can make things happen and inspire action from unwilling colleagues, Leonardo DiCaprio tried to inspire action and plenty more have lent their voice to his call so let us hope that those negotiating on our behalf at Paris have been listening.